Yes, 1862 to 2012 makes 150 years. However, there was the prelude when Nathan Tenney led six families up the Virgin River and founded Grafton’s predecessor, only to have it washed away by the famous flood of 1861, necessitating its re-founding in 1862 up the river two miles and on higher ground. Life went on like that until about 1906 when the Hurricane Canal made much larger farms available in Hurricane. People started moving there, some even moving their houses to the new site below the Hurricane Cliffs. Over time due to no electricity or drinking water Grafton essentially became a ghost town. Ironically it became even more famous as a ghost town. The old school survived, as well as a few houses. They became a perfect site for western movies to be made. The first talkie filmed outdoors, In Old Arizona in 1929 was filmed there and Grafton became even more important. The red rock landscape was the background for cowboy movies. Grafton was just one of those sites, but a very important one. Several movies were made there. Movie makers often built several structures in the town center, but they almost always used the school and the Russell house too. Then came Butch Cassidy and the Sundance Kid in 1969 with Robert Redford and Paul Newman. From that day forward Grafton has been a “must see” destination. The Grafton town site was divided into small parcels of property. Bob and Linda Attiyeh were the first to have the vision of preserving Grafton as an historic site. Linda’s father loved Grafton and took her to Grafton when she was a youngster. Bob and Linda have been buying parcels in Grafton to preserve them for over 50 years. They just planted new apple trees to fill out an old apple orchard as you come into Grafton. About 50 years after the town was abandoned in 1945 a community effort to preserve all of Grafton was started with the formation of the Grafton Heritage Partnership Project. Shirley Ballard who also preserve their historic buildings in Grafton. Washington County was a real help in the school restoration and the Johnson families who care for the pastures. The Town of Rockville has shown great support for the whole restoration effort at Grafton. It is time to remember and honor every ones contribution to preserving Grafton with too many to name them all. Our success at being stewards of Grafton depends on donations from you. We would not be able to continue our many restoration projects without your support. Please consider making a donation today. We want to extend our sincere appreciation for your continued support. The Grafton Heritage Partnership received a grant of $93,778 from the U.S. Dept. of Agriculture Natural Resource Conservation Service. The grant is to improve streamside habitat for the Southwestern Willow Flycatcher. The project is located west of Allen Lee’s gravel pit along the Virgin River. We will remove Russian olive trees and tamarisk along the river with chainsaws and treat the stumps. Willow trees will be planted along the river corridor. The Attiyeh Foundation and Jeff and Shirley Ballard are also participating in the project on their land next to the river. In addition, the BLM is starting a habitat restoration project on the river below the gravel terrace. The project will start in the fall and continue on for two years. This new book about Rockville’s history is a project completed by the Rockville Historic Preservation Commission for Rockville’s 150 Year Celebration. In 1999, the Utah Division of State History and the National Park Service provided grant funds to the Commission to make an archival photographic collection of people, places, and events important to the historical record of Rockville and surrounding communities. After the photographs were collected, some were framed and mounted and are hanging in the Rockville Community Center. The book Historic Rockville includes these pictures and explains the stories behind the photographs and Rockville’s history. The book will be available at the Grafton Reunion, at Rockville’s 150 Year Celebration Oct 13, 2012, and at Sundancer Books in Springdale. 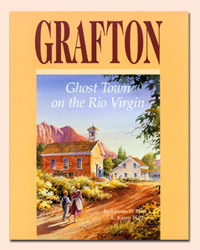 The Historic Rockville book and the book Grafton, Ghost Town of the Rio Virgin are also available on line at www.graftonheritage.org. Descendants of Grafton will hold their annual Grafton Reunion, September 29th, 2012 at the Grafton town site from 12-2:00 PM. Everyone is welcome. Bring your lunch, hat, chair and memories to share. We will have a display of historic Grafton pictures in the schoolhouse. The Grafton Heritage Partnership Project will have items available such as books, pictures of Grafton and t-shirts. There will be a program and if you have any stories you would like to tell about Grafton or a song to sing, let us know and we will put you on the program. When the Grafton Heritage Partnership was founded, our vision to preserve Grafton was a dream. We have come a long way, but we have further to go. We need your generous financial support to continue our efforts and make our dreams come true. Donations are gratefully received and tax deductible. You can donate with a credit card on our secure web page at www.graftonheritage.org- just click on Support Us. There is also a donation box at Grafton’s gate.